Bitterblue has a finer, denser texture and darker blue-green color than common St. Augustinegrass. This is an improved variety selected in the 1930s. Bitterblue has a finer, denser texture and darker blue-green color than common St. Augustinegrass. It has improved cold tolerance and good shade tolerance but is not resistant to chinch bugs or gray leaf spot disease. Its tolerance to atrazine is also lower than other varieties, making weed control more difficult. Bitterblue can produce a good lawn under proper management practices and pest control. Bitterblue St. Augustinegrasss is only intermediate in shade tolerance between the Palmetto and Seville varieties of St. Augustinegrass (somewhat tolerant) and Floratam St. Augustinegrass (basically intolerant). That's based both on artificial and natural shade tolerance studies. The other difficulty with Bitterblue is that there are few sod production farms that actually produce Bitterblue. It's close enough in appearance to Floratam that Bitterblue is sometimes misrepresented or confused with Floratam, which because of its atrazine herbicide tolerance is easier to grow for the sod producer than the Bitterblue variety of St. Augustinegrass. Bitterblue has a very coarse texture. It is a darker green color than common St. Augustine grasses. 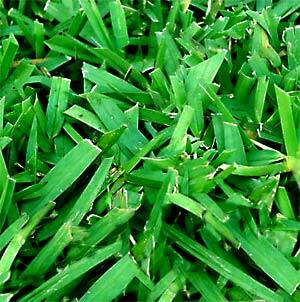 It is an improved variety of St. Augustine for cold and shade tolerant areas. Mowing Height: 3" — 4"